So the name Travigne might looks familiar because a few weeks ago I blogged about their Pizzeria. For our nice dinner in Napa, Matt and I decided to try out their more upscale restaurant. It was too dark, but I wish I could've gotten pictures of the inside of the restaurant. It has beautiful high ceilings with lots of art. The bar is made completely of wood. They also have a great outdoor seating area in a garden that is filled with twinkling lights. Matt and I started the meal with their Mozzarella Cheese "Al Minuto". It is made fresh in house and is served over grilled bread with olive oil and pepper. We also got a dish of heirloom tomatoes with balsamic and it was basically heaven in your moth. It was the freshest caprese/bruschetta I've ever had. Matt and I had to stop ourselves so we didn't ruin our dinner. For main dish I had the Spring Artichoke and Ricotta Ravioli. They have house-made pasta so it was very fresh. My only complaint was that the menu said it was served with an arrabiatta sauce which in Italy tends to be very spicy. I didn't taste any hint of spice, but it was a fresh tomato sauce. For dessert Matt and I shared a Butterscotch Panna Cotta which was topped with salted caramel sauce and creme fraiche. 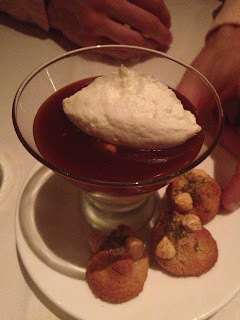 There were rosemary hazelnut cookies on the side. (Note: Matt stealing a cookie as I try to take a picture). Matt and I both have serious sweet tooths and this dish didn't disappoint. We were fighting over the last bite. 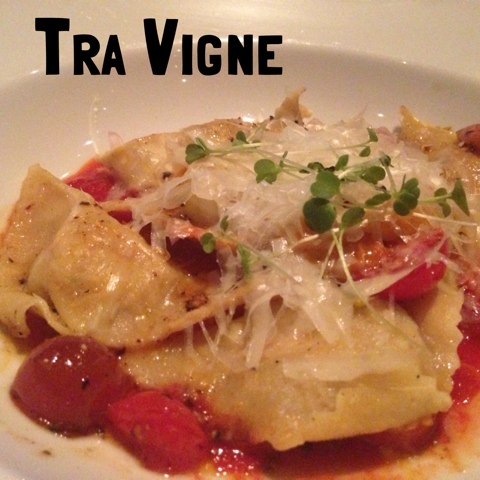 Tra Vigne has a very romantic ambiance and fabulous food. If you're heading to Napa soon, make sure to put it on your to-do list. Tip: The first bottle of wine has no corkage fee. Matt and I shared a bottle of Mondavid Un-oaked Chardonnay and it was incredible.